BossFeed Briefing for September 24, 2018. Last Monday the guy who became a laughingstock for shaving on a train to New Jersey revealed that he is homeless and was on the way to reunite with his family. Last Thursday was the one-year anniversary of Hurricane Maria hitting Puerto Rico. Last Friday, it emerged that four years after chairing a campaign to overturn Seattle’s $15 law, the owner of Flying Apron is opening a second Seattle location. And today Seattle mayor Jenny Durkan reveals her proposed 2019 city budget. 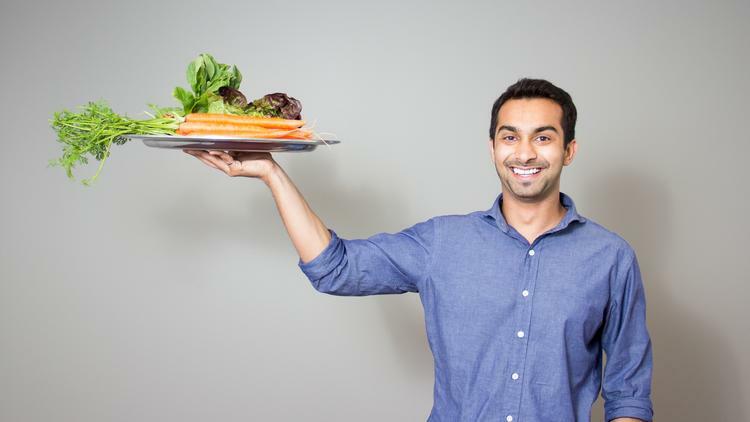 Instacart's CEO poses with a tray of produce. Instacart’s CEO says that the company needs to do “much much better” with regard to treating delivery workers. So they’re opening a call center. Lowe’s, CVS, and Home Depot could have given each of their employees an $18,000 raise with the money they spent buying back their own stock instead. Starbucks could have given each employee $7,000, and McDonald’s $4,000. A new legal settlement requires that the Hanford nuclear site test for toxic vapors in tanks where people work. Thousands of Hanford workers have been exposed to vapors from 177 tanks holding 53 million gallons of waste, which have never before been tested for toxicity. How does your work schedule work for you? Two years ago this month, Seattle City Council took on the crisis of unstable and unpredictable work schedules by passing the nation’s strongest secure scheduling law. Now you can help us take secure scheduling statewide — let us know what’s up with hours & scheduling where you work. Those savings are just going to trickle down into workers' paychecks, right? L&I announced that the cost of workers’ comp insurance is dropping 5% in Washington next year. Employers will have to pay a total of $136 million less next year than they'll pay this year. Truck drivers working out of Spokane Valley were putting in as many as 90 - 120 hours a week, but were only getting paid for 40 hours… at $11 an hour. So they got together and filed a class action lawsuit over the unpaid overtime — something which, as The Inlander reports in a remarkably comprehensive and clarifying piece, is about to get much harder due to a recent ruling by the US Supreme Court. In a 5-4 decision written by Justice Gorsuch, the Court ruled that employers can require employees to sign forced arbitration agreements that eliminate workers’ right to join class action suits. However, state Attorney General Bob Ferguson still has the right to file large-scale claims, and there are further legislative remedies our state could pursue to address the get-of-jail-free card handed to wage thieving corporations by the current court. Let us know what you think about this week's look at the world of work, wages, and inequality!